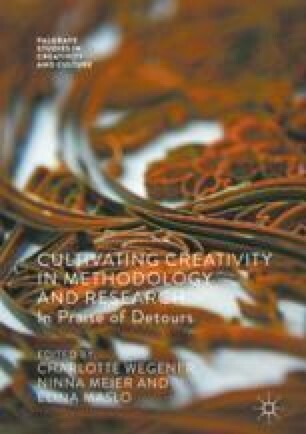 This concluding chapter reflects on the importance of detours for creativity by arguing that they offer researchers new positions and perspectives to consider their work from. Detours cultivate difference and, as such, they foster the potential for reflexivity. Importantly, they rely equally on the researcher’s sense of adventure and his or her experience of ‘beaten paths’. The meaning and value of detours for creativity rests precisely in the dialogues they encourage between experiences and perspectives. As such, they should not be judged in terms of short-term outcomes but processes. The promise of a happy ending has less to do with reaching a concrete result and much more with the playful movement between wandering and wondering in research.